Users that need an affordable all-in-one device will appreciate the Canon i-SENSYS MF8380cdw, which is specifically designed for a small workplace. It is integrated with features that promise efficiency and lower running costs, but it is not exactly user-friendly. Also, its speed is sub-par for a laser printer. This all-in-one colour laser printer comes with a Super G3 33.6 kbps fax modem, a colour copier, and a flatbed scanner. Most of the basic and advanced functions are accessible through the busy control panel with the 5-line LCD display. The scanner is integrated with an OCR. Setting up the Canon i-SENSYS MF8380cdw is easy whether through USB 2.0 or Ethernet. The device weighs similar to its predecessor (31kg) and uses 5 ink cartridges to ensure more savings. Printouts greatly improved on the i-SENSYS MF8380cdw than its predecessor, the i-Sensys MF8080cw. As a bonus, there is an automatic duplexer for the scanner and copier, too. Users can easily set-up the Ethernet connection or connect the Canon i-SENSYS MF8380cdw to their computer via USB 2.0. It also comes with an Energy Star rating, small workgroups can connect wirelessly to it, and users can print TIFF or JPEG files from a USB flash drive. Text printouts look clear and crisp. 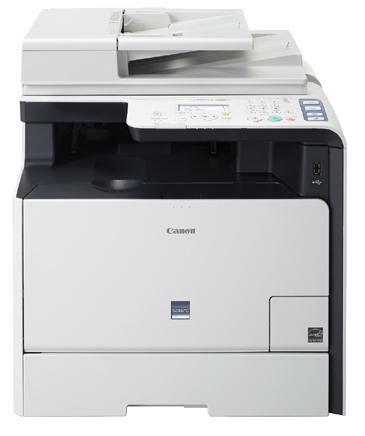 Although Canon claims 20 ppm as the speed of the Canon i-SENSYS MF8380cdw, actual tests revealed slower speeds at 11 ppm. It also tends to be noisy (up to 67 dBA of sound when operating) and is heavy, weighing 31kg and measuring 951mm high when the 250-sheet paper cassette is used. The control panel of the Canon MF8380cdw could be better and less overwhelming if it had fewer buttons and a flip-up LCD display for easy viewing. Operating the Wi-Fi feature is tricky and time-consuming, requiring users to restart when switching from an Ethernet connection. Unfortunately, the Canon MF-8380cdw is not adept at photo printing.